Ryan Banerjee (Senior Economist) discusses the rise in the number of zombie firms since the late 1980s. The BIS's analysis suggests that this increase is linked to reduced financial pressure, which in turn seems to reflect in part the effects of lower interest rates. JEL classification: D22, D24, E43, G33. Zombie firms, meaning firms that are unable to cover debt servicing costs from current profits over an extended period, have recently attracted increasing attention in both academic and policy circles. Caballero et al (2008) coined the term in their analysis of the Japanese "lost decade" of the 1990s. More recently, Adalet McGowan et al (2017) have shown that the prevalence of such companies as a share of the total population of non-financial companies (the zombie share) has increased significantly in the wake of the Great Financial Crisis (GFC) across advanced economies more generally. In this special feature, we explore the rise of zombie companies and its causes and consequences. We take an international perspective that covers 14 countries and a much longer period than previous studies. The focus on listed companies allows us to consider two different ways of identifying zombie firms: a broad measure proposed by Adalet McGowan et al (2017), based on persistent lack of profitability in mature firms; and a narrow one proposed by Banerjee and Hofmann (2018), which additionally requires expectations of low future profitability inferred from a firm's stock market valuation. First, are increases in the incidence of zombie firms just episodic, linked to major financial disruptions, or do they reflect a more general secular trend? Answering this question requires taking a sufficiently long perspective. Our database extends back to the 1980s and covers several business cycles. We find a ratcheting dynamic: the share of zombie companies has trended up over time through upward shifts in the wake of economic downturns that are not fully reversed in subsequent recoveries. The prevalence of zombie firms has ratcheted up since the late 1980s. This appears to be linked to reduced financial pressure, reflecting in part the effects of lower interest rates. Zombie firms are less productive and crowd out investment in and employment at more productive firms. When identifying zombie firms, it appears to be important to take into account expected future profitability in addition to weak past performance. Second, what are the causes of the rise of zombie firms? Previous studies have focused on the role of weak banks that roll over loans to non-viable firms rather than writing them off (Storz et al (2017), Schivardi et al (2017)). This keeps zombie companies on life support. A related but less explored factor is the drop in interest rates since the 1980s. The ratcheting-down in the level of interest rates after each cycle has potentially reduced the financial pressure on zombies to restructure or exit (Borio and Hofmann (2017)). Our results indeed suggest that lower rates tend to push up zombie shares, even after accounting for the impact of other factors. Third, what are the economic consequences of the rise of zombie companies? Previous studies have shown that zombies tend to be less productive (Caballero et al (2008), Adalet McGowan et al (2017)). Therefore, the higher share of zombie companies could be weighing on aggregate productivity. Moreover, the survival of zombie firms may crowd out investment in and employment at healthy firms. Our findings confirm these effects for more countries and a longer period. However, we find evidence of crowding-out only for the narrow measure of zombie firms. This suggests that it is important to consider expectations of future profitability in addition to current profitability when classifying firms as zombies. The remainder of the special feature is organised as follows. 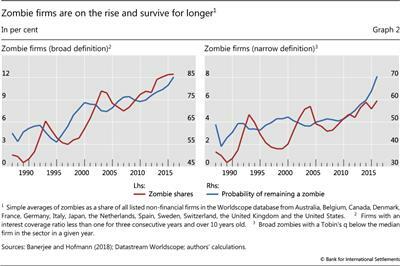 The first section documents the upward trend in the share of zombie firms since the 1980s. The second assesses the causes of their rise. The third explores the consequences for productivity and the performance of non-zombie firms. We conclude by considering some policy implications. Here we apply two alternative zombie classifications to listed non-financial corporates in 14 advanced economies using the Worldscope database covering 32,000 companies.3 The first, broader measure follows Adalet McGowan et al (2017) and identifies a firm as a zombie if its interest coverage ratio (ICR) has been less than one for at least three consecutive years and if it is at least 10 years old. The second measure is narrower. Following Banerjee and Hofmann (2018), and exploiting the fact that our database covers only listed companies for which we can observe stock market valuations, it adds the requirement that zombies should have comparatively low expected future growth potential. 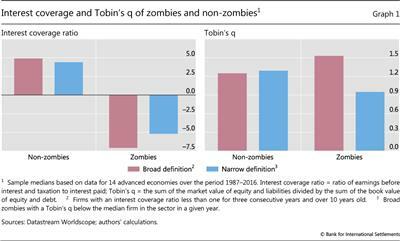 Specifically, zombies are required to have a ratio of their assets' market value to their replacement cost (Tobin's q) that is below the median within their sector in any given year. The zombies under the two definitions are very similar with respect to their current profitability, but qualitatively different in their profitability prospects. Graph 1 shows that, for non-zombie firms, the median ICR is over four times earnings under both definitions. As the majority of zombie firms make losses, the median ICRs are below minus 7 under the broad measure and around minus 5 under the narrow one. A striking difference between the broad and narrow zombie measure emerges, however, with respect to expected future profitability, as measured by Tobin's q. 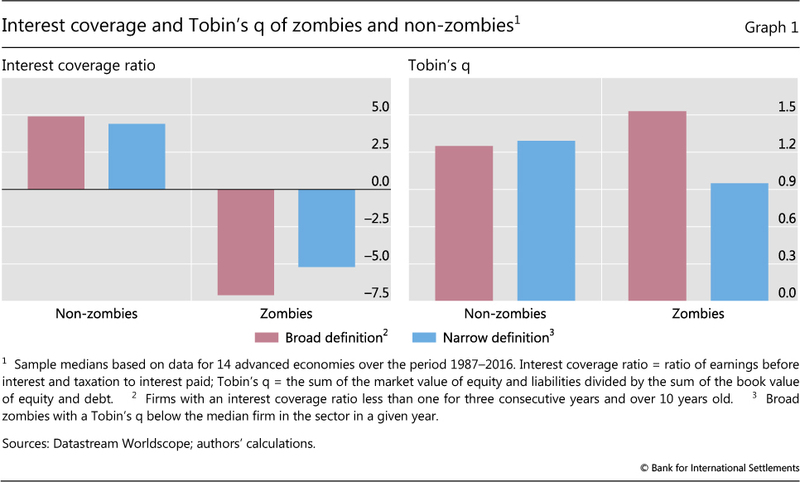 Under the broad measure, the median Tobin's q of zombie firms is higher than that of non-zombies. Investors are therefore optimistic about the future prospects of many of these zombie firms, more so than that for the non-zombies.4 By definition the narrow measure, which is designed to purge the zombie measure from this anomaly, has a lower median Tobin's q, slightly below one. Both zombie measures suggest that the prevalence of zombies has increased significantly since the 1980s (Graph 2, red lines). Across 14 advanced economies, their share rose, on average, from around 2% in the late 1980s to some 12% in 2016 under the broad definition (left-hand panel), and from 1% to about 6% according to the narrow measure (right-hand panel). The increase was not steady: upward shifts linked to economic downturns in the early 1990s, the early 2000s and 2008 were reversed only partly in subsequent years. 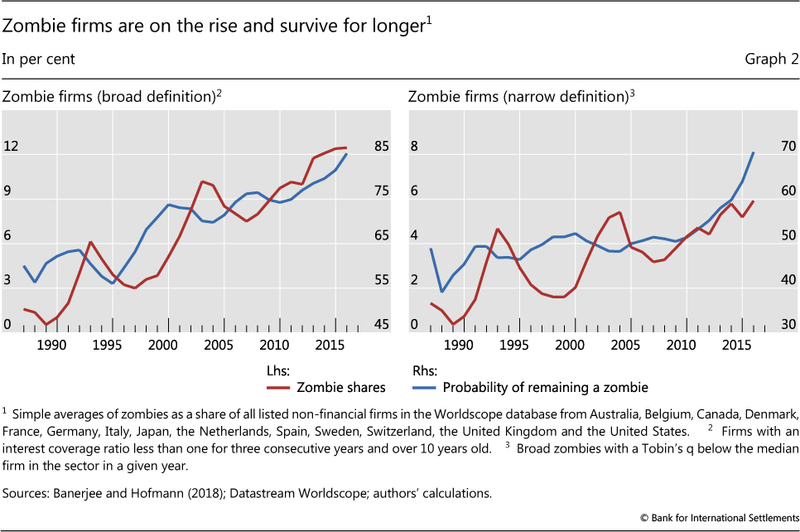 The rise of zombie firms has been driven by firms staying in the zombie state for longer, rather than recovering or exiting through bankruptcy (Graph 2, blue lines). Specifically, the probability of a zombie remaining a zombie in the following year rose from 60% in the late 1980s to 85% in 2016 (broad measure) and from 40% to 70% (narrow measure). How can corporate zombies survive for longer than in the past? They seem to face less pressure to reduce debt and cut back activity. And in contrast to what might be expected, the main change does not coincide with the GFC, but occurred in the early 2000s. Regression estimates suggest that, pre-2000, zombies (broadly and narrowly defined) cut debt at a rate of just under 2% of total assets a year relative to non-zombie firms. 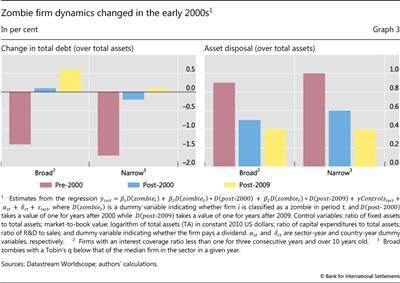 Post-2000, however, the two groups become indistinguishable, as the zombies' (relative) deleveraging speed has slowed down significantly (Graph 3, left-hand panel). There was a further mild slowdown post-2009, but it is not statistically significant. As deleveraging has slowed, zombies have been locking in more resources, hindering reallocation. Specifically, they have significantly slowed down their asset disposals relative to their more profitable peers (right-hand panel). The reduced pressure on zombies does not reflect a relative improvement in their profitability. 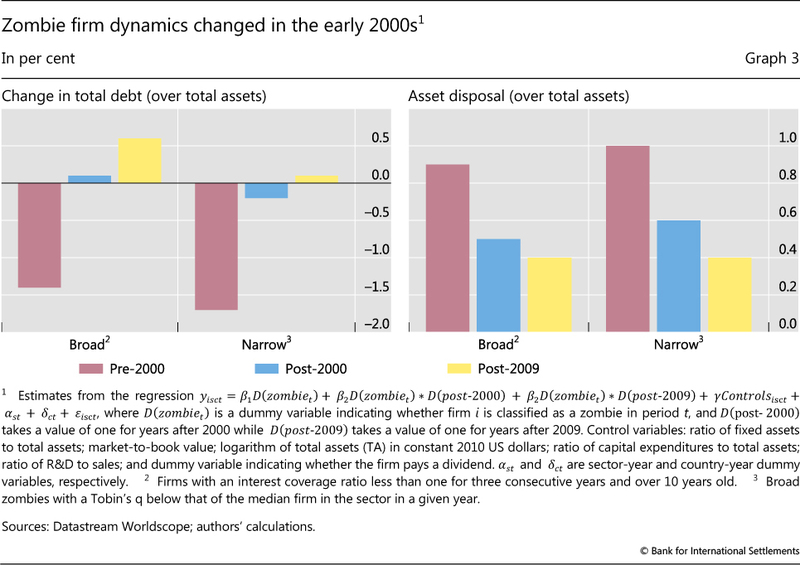 There was no significant increase in zombies' earnings before interest payments and taxes (EBIT) relative to total assets compared with non-zombies, either since 2000 or since 2009. Which factors explain this change in zombies' behaviour? The literature has identified weak banks as a potential key cause (Caballero et al (2008)). When their balance sheets are impaired, banks have incentives to roll over loans to non-viable firms rather than writing them off. Formal evidence suggests that weak banks indeed played a role in the wake of the GFC (Storz et al (2017), Schivardi et al (2017)). By inhibiting corporate restructuring, poorly designed insolvency regimes were also at work (Andrews and Petroulakis (2017)). 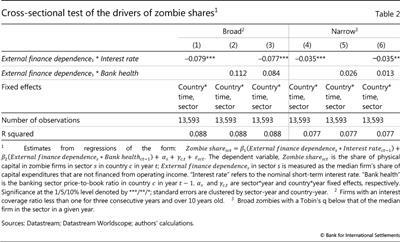 A simple way to assess whether bank health and interest rates influence the incidence of zombie firms is to assess whether changes in the two variables predict future zombie shares. Technically, Granger causality tests are designed to do this (Granger (1969)). We implement them based on country panel data over the period 1987-2016. We do so by regressing the country zombie shares on their own lags as well as five lags of the bank price-to-book ratio, of the nominal interest rate and of labour productivity growth (Table 1). We include these variables to capture any common factor that might be at work. 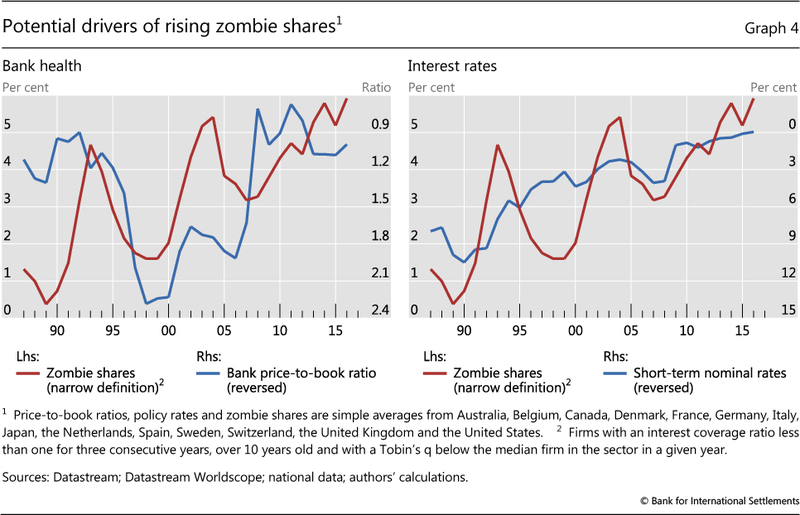 The results suggest that lower nominal interest rates predict an increase in the zombie share, while the effect of bank health is less clear-cut. The level of interest rates over the previous five years is linked to higher zombie shares, and the link is statistically highly significant (Table 1, columns (1) and (2)). An improvement in bank health (an increase in the bank's average price-to-book ratio) also significantly affects the future zombie share (column (1)), but the direction of the effect is not clear and not statistically significant (column (2)). These results suggest that the link is indeed more episodic, associated with financial distress. A more informative and more robust test of the drivers of the zombie share is to look at differences across sectors. We do so by assessing whether the effect of weaker bank health or lower interest rates is stronger in industries that are more dependent on external funding (considering 48 industries). The intuition is that firms in these industries are more sensitive to financial pressure.12 These microdata-based tests are better able to address concerns about reverse causality as well as omitted common variables, as it is possible to fully control for the influence of unobserved macroeconomic factors at the country level in any year. The results are consistent with a role for interest rates. Lower nominal interest rates push up zombie shares in those sectors where firms depend more heavily on external funding (Table 2). 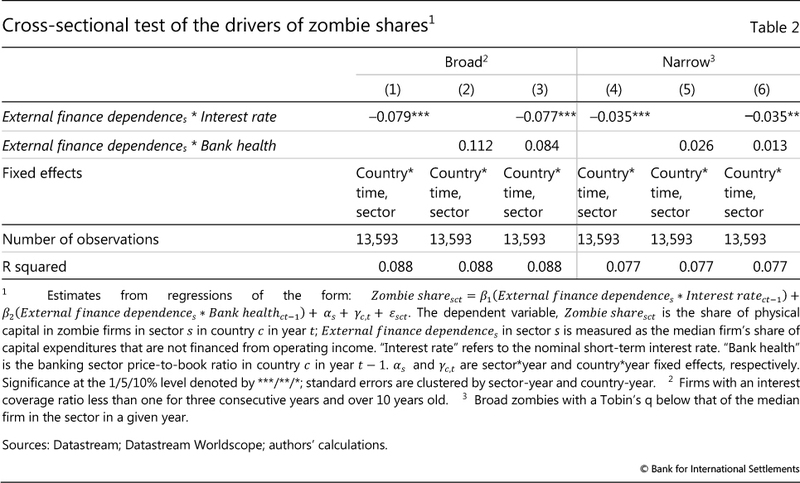 The relationship is statistically significant and the effects appear material.13 Our estimates suggest that the 10 percentage point decline in nominal interest rates since the mid-1980s may account for around 17% of the rise in the zombie share in advanced economies when evaluated at the average industry external finance dependency ratio. Similar results obtain when we use the real, rather than nominal, interest rate (not reported). The role of bank health is not visible. The interaction between external finance dependence and bank health is generally statistically insignificant (columns (2) and (5)), confirming the previous results. Previous studies have found that zombie companies may weaken economic performance (Caballero et al (2008), Adalet McGowan et al (2017)). Zombies are less productive and may crowd out growth of more productive firms by locking resources (so-called "congestion effects"). Specifically, they depress the prices of those firms' products, and raise their wages and their funding costs, by competing for resources. Our findings are consistent with this hypothesis. 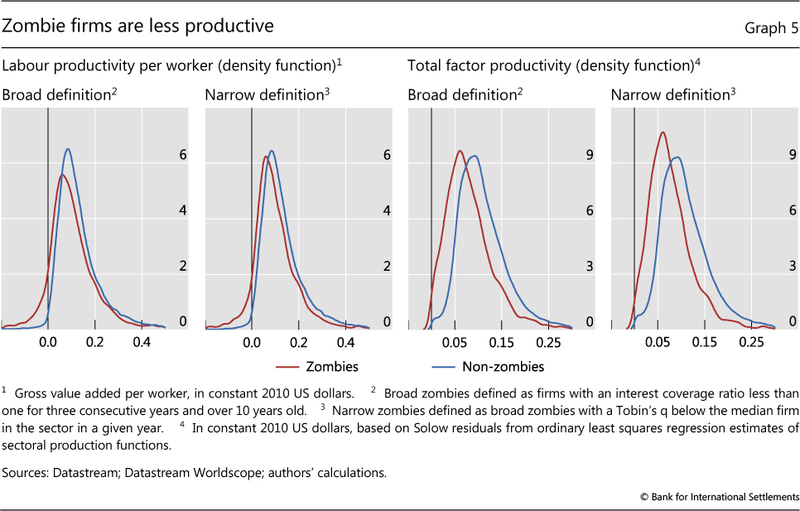 On average, labour productivity and total factor productivity of zombie firms are lower than those of their peers (under both zombie definitions): the distribution of productivity of zombies is clearly shifted towards the lower end, ie to the left (Graph 5). This is especially evident for total factor productivity (third and fourth panels). The more narrowly defined zombie firms also give rise to congestion effects, which are not visible in the case of the broader definition (Table 3). This is reflected in a negative and statistically significant coefficient for the interaction term between non-zombies and the zombie share. 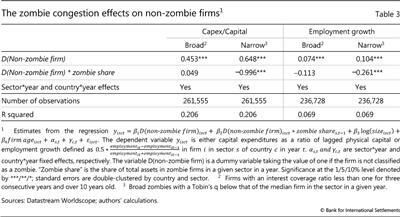 Specifically, the estimation results suggest that a 1 percentage point increase in the narrow zombie share in a sector lowers the capital expenditure (capex) rate of non-zombie firms by around 1 percentage point, a 17% reduction relative to the mean investment rate. Similarly, employment growth is 0.26 percentage points lower, an 8% reduction. However, under both definitions we find that non-zombie companies invest more and have higher employment growth (first row in Table 3). Ostensibly, it is the viable firms that expand more. 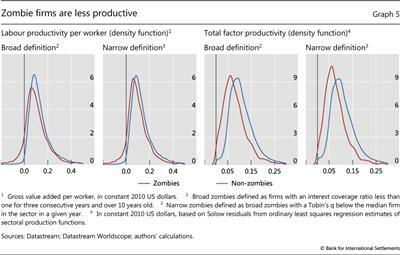 The economy-wide impact on productivity from the rise in zombie firms can be assessed by exploiting the global nature of the zombie phenomenon. In particular, to assess the productivity impact, we isolate the rise in a country's zombie share only due to the exposure of its capital stock to the global industry trends in zombification. 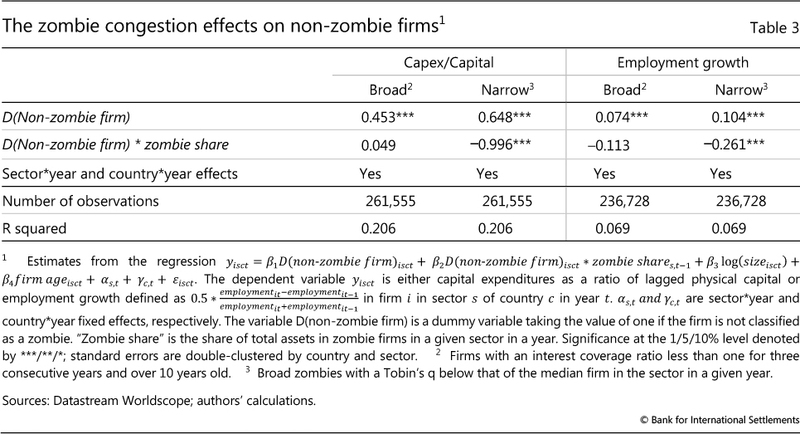 We find that when the zombie share increases, productivity growth declines significantly, but only for the narrowly defined zombies (Table 4), consistent with our previous finding of a negative zombie congestion effect for this zombie measure (Table 3). This result is robust to controlling for lagged productivity growth and cyclical factors captured by the output gap. The estimates indicate that when the zombie share in an economy increases by 1%, productivity growth declines by around 0.3 percentage points. What do our results mean for central bank policy? Among other things, they highlight a difficult trade-off (Haldane (2017)). Lower rates boost aggregate demand and raise employment and investment in the short run. But the higher prevalence of zombies they leave behind misallocate resources and weigh on productivity growth. Should this effect be strong enough to reduce growth, it could even depress interest rates further. Our study cannot answer this question. We leave the exploration of this trade-off to future research. Acharya, V, T Eisert, C Eufinger and C Hirsch (2018): "Whatever it takes: the real effects of unconventional monetary policy", New Yok University, mimeo. Adalet McGowan, M, D Andrews and V Millot (2017): "The walking dead: zombie firms and productivity performance in OECD countries", OECD Economics Department Working Papers, no 1372. Andrews, D and F Petroulakis (2017): "Breaking the shackles: weak banks and depressed restructuring in Europe", OECD Economics Department Working Papers, no 1433. Autor, D, D Dorn, L Katz, C Patterson and J Van Reenen (2017): "The fall of the labor share and the rise of superstar firms", NBER Working Papers, no 23396. Banerjee, R and B Hofmann (2018): "Corporate zombies: life cycle and anatomy", Bank for International Settlements, mimeo. Bank for International Settlements (2018): Annual Economic Report 2018, Box II.A, June. Bogdanova, B, I Fender and E Takáts (2018): "The ABCs of bank PBRs", BIS Quarterly Review, March, pp 81-95. Borio, C, L Gambacorta and B Hofmann (2017): "The influence of monetary policy on bank profitability", International Finance, vol 20, no 1, pp 48-63. Also available as BIS Working Papers, no 514, October 2015. Borio, C and B Hofmann (2017): "Is monetary policy less effective when interest rates are persistently low? ", BIS Working Papers, no 628, April. Caballero, R, T Hoshi and A Kashyap (2008): "Zombie lending and depressed restructuring in Japan", American Economic Review, vol 98, no 5, pp 1943-77. Granger, C (1969): "Investigating causal relations by econometric models and cross-spectral methods", Econometrica, vol 37, no 3, pp 424-38. Haldane, A (2017): "Productivity puzzles", speech at the London School of Economics, 20 March. Lepetit, L, F Strobel and D Dickinson (2011): "Does uncertainty matter for loan charge-offs? ", Journal of International Financial Markets, Institutions and Money, vol 22, pp 264-77. Rajan, R and L Zingales (1998): "Financial dependence and growth", American Economic Review, vol 88, no 3, 559-86. Schivardi, F, E Sette and G Tabellini (2017): "Credit misallocation during the European financial crisis", BIS Working Papers, no 669, December. Storz, M, M Koetter, R Setzer and A Westphal (2017): "Do we want these two to tango? On zombie firms and stressed banks in Europe", ECB Working Papers, no 2104. 1 The authors would like to thank Claudio Borio, Stijn Claessens, Benjamin Cohen, Ingo Fender, Hyun Song Shin and Kostas Tsatsaronis for helpful comments and Yifan Ma for able research assistance. The views expressed are those of the authors and do not necessarily reflect those of the BIS. 2 Another criterion proposed in the literature is whether a firm is receiving "subsidised" credit. Caballero et al (2008) and Acharya et al (2018) identify zombie firms as companies that received subsidised credit at rates below those for the most creditworthy companies. This identification has three potential drawbacks. First, identifying such credit with precision is difficult. Second, banks may grant subsidised credit for other reasons, such as long-standing relationships. Finally, when interest rates are very low for a long time, subsidised lending rates would have to be near zero or even negative. For these reasons, we adopt definitions that rest on the notion of persistent unprofitability, age and pessimistic market perceptions. In Banerjee and Hofmann (2018), we also assess the prevalence of subsidised credit and examine how the results based on such a definition would compare with those using the definitions adopted here. 3 We include firms from Australia, Belgium, Canada, Denmark, France, Germany, Italy, Japan, the Netherlands, Spain, Sweden, Switzerland, the United Kingdom and the United States. 4 Note that risk also affects Tobin's q. As equity can be viewed as a call option on the value of the firm, if zombies are inherently more risky this could also increase the Tobin's q of a firm. 5 Specifically, the decision to charge off or roll over will depend on how the expected repayment from a loan compares with its liquidation value, which is typically its collateral value. So, for given collateral values, higher discounted repayments can induce more banks to roll over a larger part of their bad loans, in particular in crisis times when the market for collateral can be depressed and illiquid. See Lepetit et al (2011) for a formal analysis. 6 There is evidence supporting such a link. Specifically, banks' loan charge-offs appear to rise with higher nominal rates (Lepetit et al (2011)) and the interest rate sensitivity of loan loss provisions to increases at low nominal rates (Borio et al (2017)). Moreover, banks enjoying capital gains on asset holdings owing to unconventional policy measures lowering nominal bond yields (specifically the ECB's Outright Monetary Transactions (OMT) programme) appear to have increased their supply of loans mainly to low-quality firms with which they had pre-existing lending relationships (Acharya et al (2018)). 7 Yet another factor at work could be the rise of "superstar" firms that have skewed the profitability distribution towards the largest global firms (Autor et al (2017)). The rise of superstar firms may have lowered the profitability of non-superstars, contributing to a rising share of unprofitable firms and hence of zombies. But then the question is why these unprofitable firms have not exited the market. 8 For a more detailed discussion of bank PBRs and why they are useful proxies for bank health, see Bogdanova et al (2018). 9 This is also true for real rates. 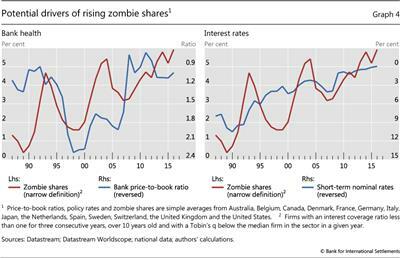 The correlation between the cross-country average zombie share and short-term ex post real interest rates is -0.75, compared with -0.76 for short-term nominal rates. In our baseline, we use nominal interest rates, but the results are almost identical if real interest rates are used. 10 A standard explanation of the long-run level of nominal interest rates is that they are determined by the level of the "natural" real rate of interest and steady state inflation. The natural real interest rate is defined as the level that equates desired saving and investment at full employment. Standard theory postulates that this rate is closely linked to an economy's trend per capita growth and hence to productivity growth. See BIS (2018) for a discussion of the concept and further references. 11 This explanation seems less plausible, as it would not explain why unproductive, loss-making firms continue to survive. 12 This is an application of the difference-in-difference method popularised by Rajan and Zingales (1998). 13 These results are also robust to removal of the commodity sectors. Firms in this sector depend greatly on external funding, but may also experience swings in commodity prices related to global economic activity.